Kits KitUV: Maxilla and mandible kit composed by U-090 & L-061. Kits Patient Demonstration Kit. Model 3. Maxillary fixed detachable screw retained prostheses over six implants. Kits PDK2: Patient Demonstration Kit. Model 2. Mandibular overdenture and fixed restorations model with two implants. Kits PDK1: Patient Demonstration Kit. Model 1. Maxillary overdenture and fixed restorations model with four implants. Kits PDK: Patient Demonstration Kit. 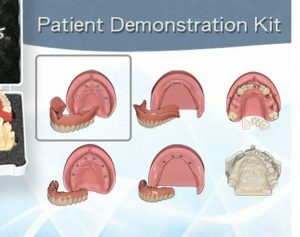 Kit for patient demonstration, showing the maxillar and mandibular overdentures and fixed restorations. Also a model with single implant restoration and a fixed partially denture implant supported. 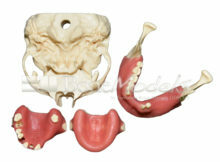 The kit contain also a maxillary edentulous models, to explain the patient the different situation of bone reabsorption and anatomical limitations, like position of the sinus. 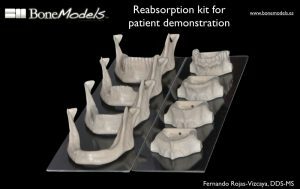 Kits RK: Reabsorption Kit Maxilla and Mandible. 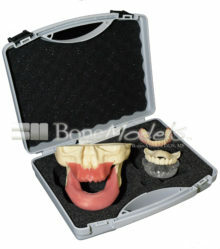 Reabsorption Kit composed by four mandible without soft tissue and four maxillae without soft tissue and sinus. Includes a mandible with all teeth, a mandible with healed ridge, a mandible with severely healed ridge and a mandible with completely healed ridge. Includes a maxilla with all teeth, a maxilla with healed ridge, a maxilla with severely healed ridge and a maxilla with completely healed ridge. 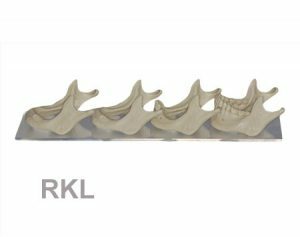 Kits RKL: Reabsorption Kit Mandible. 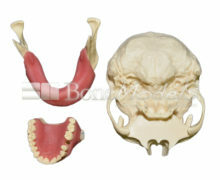 Reabsorption Kit composed by four mandible without soft tissue. Includes a mandible with all teeth, a mandible with healed ridge, a mandible with severely healed ridge and a mandible with completely healed ridge. 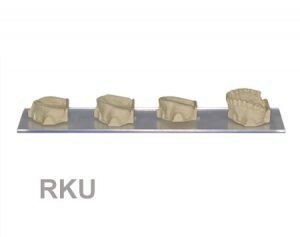 Kits RKU: Reabsorption Kit Maxilla. Reabsorption Kit composed by four maxillae without soft tissue and sinus. Includes a maxilla with all teeth, a maxilla with healed ridge, a maxilla with severely healed ridge and a maxilla with completely healed ridge.